2011 has been an interesting year for healthcare information technology. Starting in February with the launch of Direct Project pilot there has been continued momentum for health information exchange and a strong push for interoperability. Less than a year from the birth of the project, having real world implementation is lightening speed for a government sponsored effort. The Direct Project has been a remarkable success story and will have long lasting impact on health information exchange. In April I helped facilitate the DirectProject Boot Camp, which was a remarkable success. Also in February, the annual HIMSSconference was a usual highlight of the year. There was a focus on new payment and delivery models and the health IT infrastructure necessary to enable the future of healthcare, as well as a great deal of mobile healthcare applications and other innovative solutions demonstrated. One of best parts is always the Interoperability Showcase, and this year had some really great demonstrations. The new HIT X.0 format was exciting and I am looking forward to seeing how this develops in the future. Perhaps my favorite part was the increasing status of the social media efforts. The Social Media Pavilion seems to be growing by leaps and bounds and I expect next year to be bigger than ever. In April we saw the changingof the guard at ONC as Farzad Mostashari took the helm from the departing David Blumenthal. It was widely expected that Dr. Blumenthal would only lead the agency for two years. Blumenthal had cast the vision for PHR adoption and implementation of health IT and I believe that Dr. Mostashari is the ideal person to listen to the next phase. There is been a huge increase this year and the number of providers and hospitals registering for meaningful use incentive payments. With over $2 billion paid out this year so far, I expect the 2012 will be a very big year for the ONC. In June the IOM and HHS hosted the HealthData Initiative Forum to accelerate momentum for the public use of data and innovation to improve health. There was an amazing array of sessions, which were webcast live, and a truly outstanding set of speakers and panel presentations. There were fast-paced Ignite style demonstrations of a variety of innovative technology solutions. In July we launched our own DirectProject pilot. As our local health information exchange efforts have gone forward we have been blessed with a strong sense of collaboration from area stakeholders. Gorge Health Connect Inc. also achieved status as a 501(c) three charitable organization with the IRS. This was no small feat and I'm very pleased at our progress on governance and designing our technical architecture. The partnership with our vendor Medicity has been excellent and I am looking forward to watching the data flow 2012. Also in July was the first ever Health Foo in Cambridge, Massachusetts. The best summary I've seen of that amazing weekend is by Susannah Fox. O’Reilly Media and Robert Woods Johnson Foundation gathered a mind blowing stew of thought leaders. This was one of the brightest group of people I have ever been exposed to and it was an honor to participate. NationalHealth IT Week was in September with continued strong efforts at advocacy for the health IT community. One of the highlights of the week was the launch of a Consumer Health IT Program by the ONC to support greater consumer engagement in health and healthcare via information technology. The ONC’s focus on consumer engagement really gained steam this year, especially with the work of Lygeia Ricciardi, Senior Policy Advisor on Consumer eHealth. This was followed in October by the Putting the 'IT' in Care Transitions event, which brought together thought leaders from around the country to work on some of the most pressing issues facing our healthcare system. Health reform and health IT go hand in hand as the linchpin of efforts to reforming our healthcare system is technology enabled. 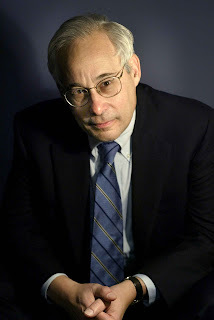 And my greatest disappointment by far in 2011 was the departure of Don Berwick from CMS. He cast a vision for investment and research in information technology leading to accountable care organizations, medical homes and other innovations in delivery and payment models. However, I am hopeful that he may actually be able to accomplish more released from the bonds of government service. His farewell speech The Moral Test:Remember the Patient is must reading for anyone interested in healthcare. The creation of the Center for Medicare and Medicaid Innovation will be an enduring legacy of Dr. Berwick’s work at CMS. Their mission to transform Medicare/Medicaid by improving the healthcare delivery system as well as implementing new models of payment will have wide ranging impact for the next generation. The HealthCare Innovation Challenge is one place I expect to see some significant results. The Centers for Medicare & Medicaid Services (CMS) hosted four webinars on its Health Care Innovation Challenge, which will spend a billion dollars through awards of up to $30 million over three years to projects that identify and test promising new payment and care delivery models for Medicare, Medicaid and the Children's Health Insurance Program. I have synced the slides with the audio to make the webinar archive easier to view. Engage a broad set of innovation partners to identify and test new care delivery and payment models that originate in the field and that produce better care, better health, and reduced cost through improvement for identified target populations. Identify new models of workforce development and deployment and related training and education that support new models either directly or through new infrastructure activities. Support innovators who can rapidly deploy care improvement models (within six months of award) through new ventures or expansion of existing efforts to new populations of patients, in conjunction (where possible) with other public and private sector partners. were available to answer questions from the audience. This second webinar was held on Tuesday, December 6th, 2011 to provide guidance on the application process with specific attention towards designing effective project proposals. potential applicants can demonstrate their path to achieving lower costs through improvement. and better health in addition to considerations for operational planning for potential applications. Let me begin by thanking the Picker Institute for this honor. I am touched to be in such good company, and especially for a theme so close to my heart – patient-centered care. And let me also say a word of personal reverence for Harvey Picker. He was a man of grace, vision, and action. He changed forever our understanding about the proper relationship between the people who get care and the people who give it. And, I need to say a word about Maureen Bisognano. For years, I have known that the luckiest step in my entire professional career was Maureen’s joining IHI in 1995. She made into the organization it has become. She is the best colleague I have ever had – bar none. Now, I know that that was the second luckiest step. The new luckiest step was Maureen’s willingness to become IHI’s President and CEO. Thanks to her, I can see after this time away, IHI has soared to entirely new heights with stronger patient voice, wider global reach, an Open School that now includes 74,000 students, and a whole new level of presence and gravitas in the global health care scene. Maureen, you are a treasure – a global treasure, and it is an honor to have you as our leader. It is good to be back. For me, the past 16 months have been quite an expedition; I feel like Marco Polo. Never having expected it, I journeyed into the world of national policy and politics at the most tumultuous time for both modern American health care and the modern global economy. To keep things in perspective, I also watched grandson #1 – Nathaniel – grow to 2 ½ years old, and we welcomed grandson #2 – Caleb – into the world 8 weeks ago. The time at CMS has been a privilege. I got the chance to work with thousands of career public servants, and to learn how much these people do for us all, unsung and too often unappreciated. These are the people who translate laws into regulations and regulations into deeds. In CMS these are the people who keep the lights on – they see that providers get paid, they protect the public trust, they help the most vulnerable people in America, and make sure that they get the care they need. And, I got the chance to help pilot toward harbor the most important health care policy of our time – the Affordable Care Act. A majestic law. I learned that a law is only a framework; it’s like an architect’s sketch. If it’s going to help anyone, it has to be transformed into the specifications that regulations and guidance documents. Only then can become real programs with real resources that reach real people. On my expedition, that, mostly, was what I was doing. I would have loved to keep at that job longer. But, as you know, the politics of Washington, and especially the politics of the United States Senate, said, “No.” But, overall, I don’t feel an ounce of regret. What I feel is grateful for the chance I had to serve, and for the generous support I felt, including from so many of you. I want this afternoon to share with you a little of what I learned on the expedition; and what I think it means for you – for all of us. It’s a sort of good-news-bad-news situation. The good news: the possibility of change has never been greater – not in my lifetime. The bad news: if it’s going to be the right change, the burden is yours. When I first got the job, my brother, Bob, a retired middle school science teacher and a very wise man, gave me a sign to put on my desk. It read, “How will it help the patient?” It was there from the minute I arrived until the minute I left. Maureen gave me the same sort of advice just before I left IHI. I asked her how I could succeed at CMS, and she said, “That’s easy; just mention a patient five times a day.” Bob’s advice and Maureen’s was the best I got – hands down – from anyone else anywhere else. Remember the patient. In that self-absorbed culture, the question, “How does it help the patient?” isn’t always the first one asked. In fact, it can seem naïve – not on point. And yet, I learned that, in Washington, DC, just like here, it is exactly the right question. The best public policy and the best public management answer it. This is only Harvey Picker’s idea reframed – from patient-centered care to patient-centered policy. And that leads me to a second big lesson. I can best explain it to you by describing a visit I made in the fall of 2011 to a small rural hospital – Lower Umpqua Hospital in Reedsport, Oregon. I was on a so-called “Rural Road Trip” visiting rural hospitals to learn from them. Cynicism grips Washington. It grips Washington far too much... far too much for a place that could instead remind us continually of the grandeur of democracy. I vividly remember my first trip ever to Washington, DC. I was twelve years old, and friends took me to the Lincoln Memorial just after sunset. I looked from the statue of Abraham Lincoln, past the Reflecting Pool and the Washington Monument, to the glowing Capitol Building in the distance – the same Capitol that I saw outside my office window every day for the past 16 months. And, twelve years old, I cried in awe and admiration for – what shall I call it? - majesty. Two weeks ago, Congress’s approval rating fell to an all-time low: 9%. How did that happen? It happens when the cynics are winning. In a city where everyone wishes to be in a room they are not yet in, it is easy to see everyone as on the make, everyone maneuvering, everyone with elbows sharpened. It becomes too easy to lose hope and confidence, and to forget what can be noble in human nature. When the lens through which one sees the world magnifies combat, dissembling, and greed, then trust decays and those who deserve to be trusted feel bad – misunderstood, confused, and impeded in their good works. Dr. Robert Law is not cynical, and he is not on the make. He is dedicated to a life of service to a community he loves, and in which he raised his own three children – Alison, Brian, and Duncan. The job of public servants is to serve him so that he can better serve others. He needs help, resources, encouragement, voice, and respect. His promise – what he can offer our nation – has nothing to do with preventing fraud, holding his feet to the fire, or audits, and it has little to do with payment for performance, public measurement, incentives, or accountability. He is a good person who needs dignified assistance to do good work… and he is legion. He can be the future. He, in fact, can and will rescue us, if we will help him help us. If lesson one for me is, “Remember the patient,” then lesson two is this: “Help those who help others.” Those thoughts – not the negativity – guided my in DC, and they made my time there meaningful. They are reminders of what is truly important; not the noise, but simply this: to help the people who need our help the most. Inscribed on the wall of the great hall at the entrance to the Hubert Humphrey Building, the HHS Headquarters in Washington where my office was, is a quotation from Senator Humphrey at the building’s dedication ceremony on November 4, 1977. It says: "The moral test of government is how it treats those who are in the dawn of life, the children; those who are in the twilight of life, the aged; and those in the shadows of life, the sick, the needy and the handicapped." I believe that. Indeed, I think that Senator Humphrey described the moral test, not just of government, but of a nation. This is a time of great strain in America; uncertainty abounds. With uncertainty comes fear, and with fear comes withdrawal. We can climb into our bunkers, each separately, and bar the door. But, remember, millions of Americans don’t have a bunker to climb into – they have no place to hide. For many of them, indeed, the crisis of economic security that we all dread now is no crisis at all – it is their status quo. The Great Recession is just their normal life. The rate of poverty in this country is rising. Over 100 million Americans – nearly one in every three of us – is in poverty or near-poverty today – 17 million of them children. I will tell you – state by state, community-by-community, and in the halls of Washington, itself – the security of the poor – their ability to find the health care they need, and the food, and the housing, and the jobs, and the schools – all of it, hangs by a thread. The politics of poverty have never been power politics in America, for the simple reason that the poor don’t vote and the children don’t vote and the sickest among us don’t vote. And, if those who do vote do not assert firmly that Senator Humphrey was right, and if we do not insist on a government that passes the moral test – the thread will break, and shame on us if it does. Cynicism diverts energy from the great moral test. It toys with deception, and deception destroys. Let me give you an example: the outrageous rhetoric about “death panels” – the claim, nonsense, fabricated out of nothing but fear and lies, that some plot is afoot to, literally, kill patients under the guise of end-of-life care. That is hogwash. It is purveyed by cynics; it employs deception; and it destroys hope. It is beyond cruelty to have subjected our elders, especially, to groundless fear in the pure service of political agendas. The truth, of course, is that there are no “death panels” here, and there never have been. The truth is that, as our society has aged and as we have learned to care well for the chronically ill, many of us face years in the twilight our lives when our health fades and our need for help grows and changes. Luckily, palliative care – care that brings comfort, company, and spiritual and emotional support to people with advanced illness and their families – has grown at its best into a fine art and a better science. The principle is simple: that we can and should offer people the very best of care at all stages of their lives, including the twilight. The truth is, furthermore, that patient-centered care demands that the ways in which a person is cared for ought always to be under his or her control. The patient is the boss; we are the servants. They, not others, should direct their own care, and the doctors, nurses, and hospitals should know and honor what the patient wants. Some of us want to be guaranteed that, no matter how sick or close to death we are, every single machine, drug, and device that could help us live even a moment longer should be used; and that is, therefore, exactly what they should have. And, other if us want not to spend our final days in an intensive care unit, attached to machines, but rather, say, to be at home, in our own bed surrounded by our loved ones in a familiar place, but still receiving world-class treatment for pain and complications; then that is, therefore, exactly what they should have. It is one of the great and needless tragedies of this stormy time in health care that the “death panel” rhetoric has denied patients the care that they want, denied caregivers the information they need to give that care, and denied our nation access to a mature, open, informed, and balanced discussion of the challenge of advanced illness and the commitment to individual dignity. It is a travesty. If you really want to talk about “death panels,” let’s think about what happens if we cut back programs of needed, life-saving care for Medicaid beneficiaries and other poor people in America. What happens in a nation willing to say a senior citizen of marginal income, “I am sorry you cannot afford your medicines, but you are on your own?” What happens if we choose to defund our nation’s investments in preventive medicine and community health, condemning a generation to avoidable risks and unseen toxins? Maybe a real death panel is a group of people who tell health care insurers that is it OK to take insurance away from people because they are sick or are at risk for becoming sick. Enough of “death panels”! How about all of us – all of us in America – becoming a life panel, unwilling to rest easy, in what is still the wealthiest nation on earth, while a single person within our borders lacks access to the health care they need as a basic human right? Now, that is a conversation worth having. And, while we are at it, what about “rationing?” The distorted and demagogic use of that term is another travesty in our public debate. In some way, the whole idea of improvement – the whole, wonderful idea that brings us –thousands – together this very afternoon – is that rationing – denying care to anyone who needs it is not necessary. That is, it is not necessary if, and only if, we work tirelessly and always to improve the way we try to meet that need. The true rationers are those who impede improvement, who stand in the way of change, and who thereby force choices that we can avoid through better care. It boggles my mind that the same people who cry “foul” about rationing an instant later argue to reduce health care benefits for the needy, to defund crucial programs of care and prevention, and to shift thousands of dollars of annual costs to people – elders, the poor, the disabled – who are least able to bear them. When the 17 million American children who live in poverty cannot get the immunizations and blood tests they need, that is rationing. When disabled Americans lack the help to keep them out of institutions and in their homes and living independently, that is rationing. When tens of thousands of Medicaid beneficiaries are thrown out of coverage, and when millions of Seniors are threatened with the withdrawal of preventive care or cannot afford their medications, and when every single one of us lives under the sword of Damocles that, if we get sick, we lose health insurance, that is rationing. And it is beneath us as a great nation to allow that to happen. And that brings me to the opportunity we now have and a duty. A moral duty: to rescue American health care the only way it can be rescued – by improving it. I have never seen, nor had I dared hope to see, an era in American health care when that is more possible than this very moment. The signs are everywhere. In the past two years, major hospital systems are asking at last how they can coordinate care. Specialty societies are coalescing around plans for more evidence-based care, the use of clinical registries, serious recertification, and reduction of overuse of unhelpful care. The patient safety movement is maturing, with numerous national efforts to bring excellence to scale, including the billion-dollar Partnership for Patients that we launched in HHS. Insurers are experimenting with much more integrated payment models, of which Accountable Care Organizations are only one breed. Transparency is, I believe and hope, about to leap forward. Patients’ and consumers’ groups are more active and more sophisticated, and they are gaining the footholds they need in governance. Employer groups and labor unions are uniting in their demands. And states are on the move – states like Oregon, Arkansas, and Massachusetts – where courageous and visionary governors – like John Kitzhaber, Mike Beebe, and Deval Patrick – are catalyzing transformation. And, though no sane person would have wished on us the most serious economic crisis since the Great Depression, the global downturn has added tons to the pressure for change. We are headed for a cliff, and we need to change course. And that means health care needs to change course. To be clear, we have not changed course yet. Not enough. Not hardly. All the unfreezing has not yet moved health care into its new and needed state. In truth, we have only been getting ready. The Affordable Care Act helps, but, a law is not change – it set the table for change. A Constitutional provision for a free press does nothing until a press turns somewhere. And a law that provides support for seamless, coordinated care has done nothing until some person who needs it gets it. This is the threshold we have now come to, but not yet crossed: the threshold from the care we have to the care we need. We can do this… we who give care. And nobody else can. The buck has stopped. The Federal framework is set by the Affordable Care Act and important prior laws, such as the HITECH Act, and, quite frankly, we can’t expect any bold statutory movement with a divided Congress within the next year or more. The buck has stopped; it has stopped with you. Now comes the choice. To change, or not to change. It is not possible to claim that we do not know what to do. We have the templates. If you doubt it, visit the brilliant Nuka care system at Southcentral Foundation in Anchorage, which just won the Baldrige Award. I visited in October. Thoroughly integrated teams of caregivers – physicians, advanced practice nurses, behavioral health specialists, nutritionists, and more – occupying open physical pods in line-of-sight contact with each other all day long, weaving a net of help and partnership with Alaska Native patients and families. The results: 60% fewer Emergency and Urgent Care Visits, 50% fewer hospitalizations, and 40% less use of specialists, along with staff turnover 1/5th as frequent as before the new care. If you doubt that we know what to do, visit Denver Health or ThedaCare or Virginia Mason, and see the Toyota principles of lean production learned, mastered, adapted, and deployed through entire systems and into the skills and psyches of entire workforces. The result, over $100 million in savings at Denver Health while vastly improving the experience and outcomes of patients. If you doubt that we know what to do, contact George Halvorson at Kaiser Permanente and ask him how they have reduced sepsis mortality – sepsis is the cause of death in 24% of seniors who die in California hospitals. Kaiser-Permanente has driven down sepsis mortality by nearly half – to 11% in less than three years. Let me put it simply: in this room, with the successes already in hand among you here, you collectively have enough knowledge to rescue American health care – hands down. Better care, better health, and lower cost through improvement right here. In this room. The only question left is: Will you do it? When we entered the world of health care improvement as our life’s work, we didn’t ask for the burden we now bear. We did not ask to be responsible for rescuing health care. But, here we are, and, as intimidating as the fact may be, that burden is ours. Our nation is at a crossroad. The care we have simply cannot be sustained. It will not work for health care to chew ever more deeply into our common purse. If it does, our schools will fail, our roads will fail, our competitiveness will fail. Wages will continue to lag, and, paradoxically, so will our health. The choice is stark: chop or improve. If we permit chopping, I assure you that the chopping block will get very full – first with cuts to the most voiceless and poorest us, but, soon after, to more and more of us. Fewer health insurance benefits, declining access, more out-of-pocket burdens, and growing delays. If we don’t improve, the cynics win. That’s what passes the buck to us. If improvement is the plan, than we own the plan. Government can’t do it. Payers can’t do it. Regulators can’t do it. Only the people who give the care can improve the care. “Do everything” – that’s Socolow’s answer to the global warming problem. Luckily, nothing more than everything is necessary, and, unluckily, nothing less than everything is sufficient. Socolow diagrammed “everything” as what he called, “wedges.” In his chart, the lower line is the line of “sustainability.” It shows the highest levels of atmospheric carbon that do not lead to runaway warming. It’s the goal. The top line is the “business as usual” line; it shows how fast carbon levels rise if we stay on the current course. The “wedges” – Socolow proposes 15 of them – 15 changes that affect carbon output – fill what Socolow calls the “sustainability triangle.” The “wedges” framework looks a lot like a strategic plan, or at least a system of strategic goals, whose cumulative effect – all together – is a sustainable level of carbon, so that we don’t cook Planet Earth. Solving the health care crisis has wedges, too. We don’t have as crystal clear a target – a sustainability level that works for total US health care spend – but for sure our business-as-usual line isn’t it. Pay on that line over time, and schools suffer, roads suffer, museums suffer, and private consumption suffers because, as Tom Nolan said years ago, “It’s our money.” It is all wages. Now, I probably owe you an apology for talking about costs. I know that, among the important dimensions of quality – safety, effectiveness, patient-centered care, timeliness, efficiency, and equity – I am not sure any of us would have chosen “efficiency” – the reduction of waste – as our favorite. It’s not my favorite. Nonetheless, it is the quality dimension of our time. I would go so far as to say that, for the next three to five years at least, the credibility and leverage of the quality movement will rise or fall on its success in reducing the cost of health care – and, harder, returning that money to other uses – while improving patient experience. “Value” improvement won’t be enough. It will take cost reduction to capture the flag. Otherwise, “cutting” wins. But, I am not going to apologize. That’s because if you are a student of lean thinking or quality, itself – if you have taken the time to study the work of Noriaki Kano, or Jim Womack, or Taichi Ohno, or Dr.Deming, you know that great leverage in cost reduction comes directly – powerfully – exactly from focusing on meeting the needs of the person you serve. “Waste” is actually just a word that means, “Not helpful.” So, that initial wave of reaction – “Who wants to work on efficiency” – is actually off the mark. In very large measure, improving care and reducing waste are one and the same thing. How much cost reduction? Well, If we look to Europe for ideas, then a target of, say, 12% of our GDP, far below our current 17% would look plausible. If you want to stay at home for signals, find the lowest cost quartile of American health can economies – hospital referral regions or HRRs – and we’d be somewhere in the neighborhood of 15% of GDP. Or, maybe that looks tough, and you’d be more comfortable if health care began to behave just as well as, but no better than, the rest of the economy – that is, rising in synch with the GDP, itself, and just staying where it is – 17% or so. The point is, with costs rising a great deal faster than that, no matter what your goal is, you’ve got a sustainability triangle to fill – the growing, cumulative difference between unsustainable “business as usual” costs and the sustainable ones. The social imperative for reducing health care cost is enormous. And, to meet that enormous need, I suggest, just as with the environmental triangle, for the health care cost triangle, nothing works. Only everything works. It’s all or none, or we head straight on and over the cliff. Andy Hackbarth and I took a stab at defining the “wedges” for health care costs. These are the names of the forms of waste whose removal from the system both helps patients thrive and reduces the cost of care. We found six wedges, for starters, and we estimated their size. Overtreatment – the waste that comes from subjecting people to care that cannot possibly help them – care rooted in outmoded habits, supply-driven behaviors, and ignoring science. Failures of Coordination- the waste that comes when people – especially people with chronic illness – fall through the slats. They get lost, forgotten, confused. The result: complications, decays in functional status, hospital readmissions, and dependency. Failures of Reliability – the waste that comes with poor execution of what we know to do. The result: safety hazards and worse outcomes. Administrative Complexity – the waste that comes when we create our own rules that force people to do things that make no sense – that converts valuable nursing time into meaningless charting rituals or limited physician time into nonsensical and complex billing procedures. Pricing Failures – the waste that comes as prices migrate far from the actual costs of production plus fair profits. Fraud and Abuse – the waste that comes as thieves steal what is not theirs, and also from the blunt procedures of inspection and regulation that infect everyone because of the misbehaviors of a very few. We have estimated how big this waste is – from both the perspective of the Federal payers – Medicare and Medicaid – and for all payers. Research and analytic literature contain a very wide range of estimates, but, at the median, the total annual level of waste in just these six categories (and I am sure there are more) exceeds $1 trillion every year – perhaps a third of our total cost of production. Put the patient first. Every single deed – every single change – should protect, preserve, and enhance the well-being of the people who need us. That way – and only that way – we will know waste when we see it. Among patients, put the poor and disadvantaged first – those in the beginning, the end, and the shadows of life. Let us meet the moral test. Start at scale. There is no more time left for timidity. Pilots will not suffice. The time has come, to use Göran Henrik’s scary phase, to do everything. In basketball, they call it “flooding the zone.” It’s time to flood the Triple Aim zone. Return the money. This is the hardest principle of them all. Success will not be in our hands unless and until the parties burdened by health care costs feel that burden to be lighter. It is crucial that the employers and wage-earners and unions and states and taxpayers – those who actually pay the health care bill – see that bill fall. Act locally. The moment has arrived for every state, community, organization, and profession to act. We need mobilization – nothing less. On my last night in Washington, I visited the Lincoln Memorial again – standing at the same spot that I had stood at as a twelve-year-old boy 53 years ago. The majesty was still there – the visage of Lincoln, the reach of the Washington Monument, the glow of the Capitol Dome. It was still unbearably beautiful. Still majestic. But, there was one change. Chiseled in the very stone where I was standing is now the name of Dr. Martin Luther King and the date – August 28, 1963, when he gave his immortal “I have a dream…” speech. When I first stood at that spot, the Montgomery Bus Boycott was only three years in the past, and Dr. King’s speech lay five years in the future. Rachel Carson’s book, “Silent Spring,” was four years in the future. And it would be six years before the phrase, “Women’s Liberation,” would first be used in America. I thought, standing there, of something I once heard Dr. Joseph Juran say: “The pace of change is majestic.” And I mused about that majesty, and its nature. It occurred to me that the true majesty lay not just in the words – not just in the call – but also in the long and innumerable connections between the ideas that stir us – the dreams – and the millions and millions of tiny, local actions that are the change, at last. A dream of civil rights becomes real only when one black child and one white child take one cooling drink from the same water fountain or use the same bathroom or dine together before the movie they enjoy together. An environmental movement becomes real only when one family places one recycle bin under one sink or turns off one unneeded light out of respect for an unborn generation. Women’s rights are not real until one woman’s pay check stub reads the same as one man’s, and until my daughter really can be anything she wants to be. The majesty is in the words, but the angel is in the details. And that is where you come in. Here is the lesson I bring you from 16 months in Washington, DC. Your time has come. You are on the cusp of history – you, not Washington, are the bridge between the dream and the reality – or else there will be no bridge. Our quest – for health care that is just, safe, infinitely humane, and that takes only its fair share of our wealth – our quest may not be as magnificent as the quest for human rights or for a sustainable earth, but it is immensely worthy. You stand, though you did not choose it, at the crossroads of momentous change – at the threshold of majesty. And – frightened, fortunate, or both – you now have a chance to make what is possible real. The White House has nominated Marilyn Tavenner to run the Center for Medicare and Medicaid Services (CMS), following the resignation of former CMS Administrator Don Berwick, which is a huge disappointment. She will serve as the agency's interim administrator during the confirmation process. Tavenner has served as CMS' principal deputy administrator since February 2010 and served as CMS' acting administrator between February 2010 and July 2010. During her tenure at CMS, Tavenner has helped oversee Medicare, Medicaid and the Children's Health Insurance Program. She also had responsibility for the Center for Consumer Information and Insurance Oversight (CCIIO) which has been responsible for the health reform waivers issued by the agency. Prior to working for CMS, Tavenner served as secretary of Virginia's Health and Human Services agency. She also has worked for the Hospital Corporation of America, where she started as a staff nurse and eventually served as president of outpatient services. Then former Governor Timothy Kaine appointed her as Virginia’s Secretary of Health and Human Resources where she oversaw 12 agencies that employed 18,000 people. Many stakeholder groups have praised the nomination of Marilyn Tavenner as Berwick's successor. The AMA released a statement in favor of the appointment saying "she has been fair, knowledgeable and open to dialogue." The AHA said in a statement that Tavenner’s "varied and rich background as a former nurse, health care executive, and government official at the state level gives her a very unique perspective in understanding both the implications of public policy and their implementation." AHIP gave a simple endorsement saying simply: "Marilyn Tavenner’s proven leadership ability and wealth of experience in both the private and public sectors are invaluable assets to CMS as it seeks to address the many health care challenges facing the nation. We look forward to continuing to work with her to improve the quality, safety, and affordability of health care in America." However not all groups are in favor of Tavenner. "Scrutiny of Tavenner should be no less intense than of Berwick,” stated Jane M. Orient, M.D., executive director of the Association of American Physicians and Surgeons (AAPS). The AAPS released a statement very critical of her appointment. There is also likely to be continuing scrutiny from Republican lawmakers, despite House Majority Leader Eric Cantor's approval, who said, "Obviously, I'm not in the Senate, so I don't have that vote, but I do think she is qualified." If confirmed as CMS administrator, Tavenner would also oversee the allocation of an estimated $27 billion in health IT incentive payments. Under the HITECH Act, healthcare providers who demonstrate meaningful use of certified electronic health record systems can qualify for Medicaid and Medicare incentive payments. In remarks to the National Association of Medicaid Directors last month, Tavenner shared her thoughts on how to control health care costs in ways very similar to the ideas Berwick has expressed. "The only way to stabilize costs without cutting benefits or provider fees is to improve care to those with the highest health care costs," she said. She also opposed Republican efforts to turn Medicaid into a block grant that would limit the amount of federal funding states can receive for the program. "That approach would simply dump the problem on states and force them to dump patients, benefits or make provider cuts or all the above," she said. Politico has also unearthed audio of Dr. Berwick's replacement speaking quite highly of the health reform legislation, which will certainly be an issue at confirmation hearings. Marilyn Tavenner speaking to the Nashville Healthcare Council in reference to replacing Berwick said,“Whether I'm nominated or not, we would not have a different approach." A new "Benchmark Study on Patient Privacy and Data Security," conducted by the Ponemon Institute, and sponsored by ID Experts, found that health data breaches are rising rapidly. This is partly contributing to medical identity theft which is costing the healthcare industry billions annually. From 2010 to 2011 the frequency of data breaches in health care organizations increased by 32 percent, with hospitals and health care providers averaging four data breaches per organization, according to the study. Three leading causes of data breaches in health care were lost or stolen equipment, errors by third parties and employee mistakes. Third-party mistakes, including business associates, account for 46 percent of data breaches reported in the study. 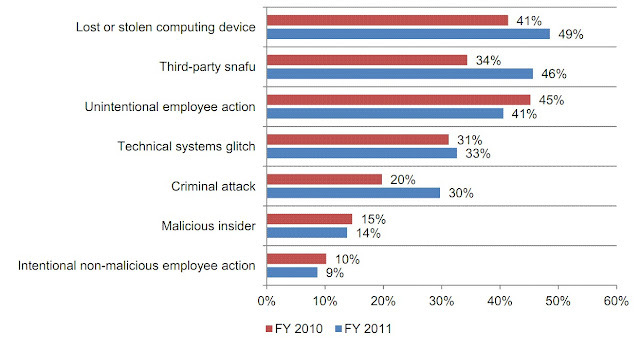 However, sloppy mistakes by employees have led to many data breach increases, according to 41 percent of respondents. 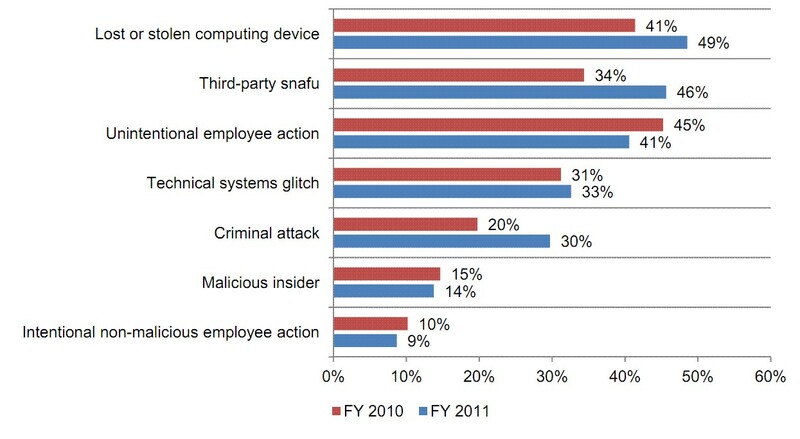 And unintentional employee negligence was the primary cause of data breaches, due in part to increased use of mobile devices by employees. More than 80 percent of health care organizations use mobile devices that collect, store, and transmit some form of personal health information, yet half of all respondents to the study reported that measures were not taken to protect these devices. Securing health information on mobile devices is a new frontier for many organizations. According to the research, 55 percent of health care organizations say they have little or no confidence they are able to detect all privacy incidents. In fact, 61 percent of organizations are not confident they know where their patient data is physically located. Only 22 percent of organizations say their budgets are sufficient to minimize data breaches. 83 percent of hospitals have clearly written policies and procedures to notify authorities of a data breach, but 57 percent don’t believe their policies are effective.